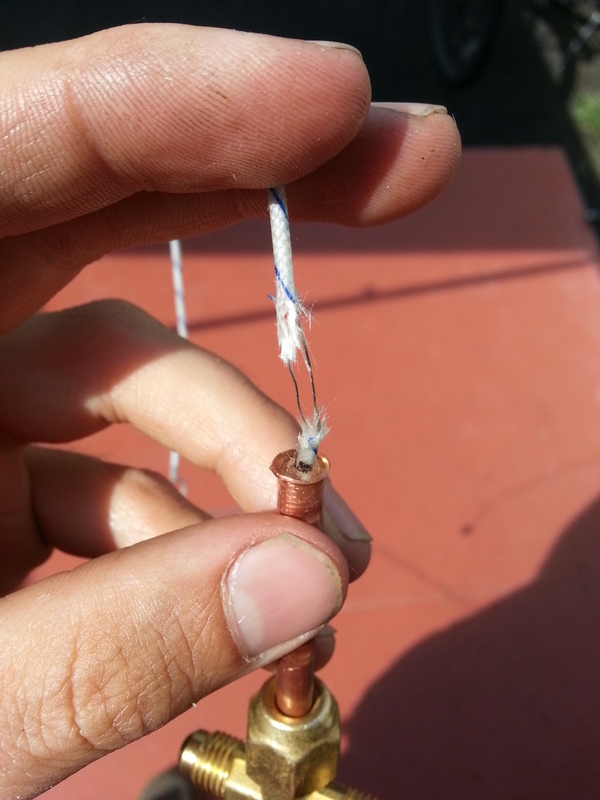 I thought I would provide some media to help describe my method of installing thermocouples into refrigeration lines. 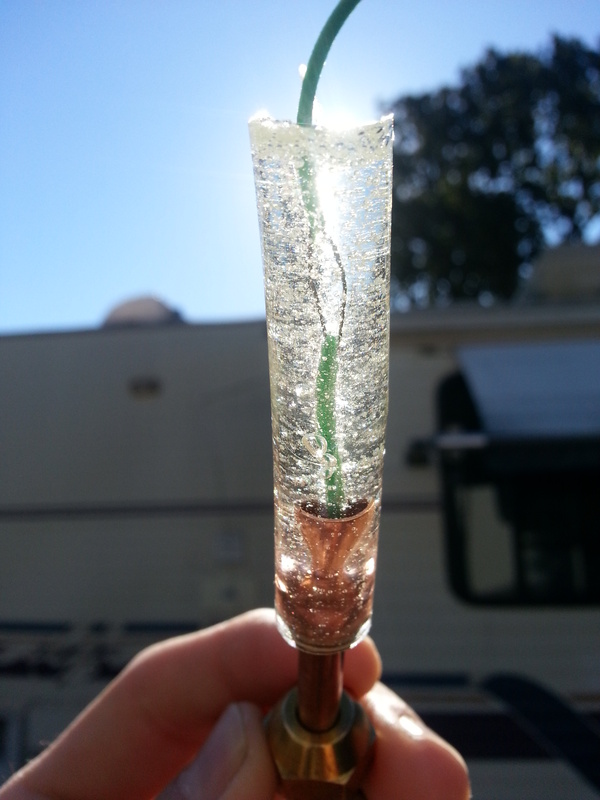 I’ve found in working with the Ebullator, that the temperature readings I was getting by taping thermocouple tips to the outside of the copper lines of interest, were not particularly trustworthy, and did not have the response time I was seeking. It was suggested to me by a friend, to install them directly in the system, so that readings were taken from the passing liquid or vapor streams. I don’t believe he was exactly sure how to accomplish this, nor was I; the pressures these devices would be exposed to could be in excess of 350 psi. I chose to embed the thermocouple lines in a casting of epoxy, such that the tip of the thermocouple would be suspended in a brass tee with male 1/4″ flare fittings. 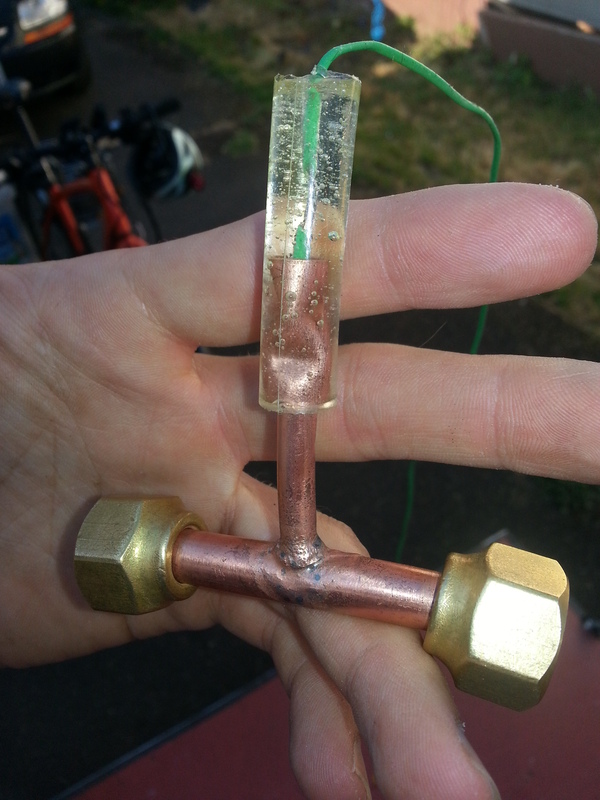 A short copper stub would be made to fit to the central fitting, whereby the thermocouple wire would be run down through said stub. Epoxy would be poured into a form made from a piece of flexible tubing or pipe, and poured epoxy would seal off the relatively higher pressure refrigerant gases from escaping. My first concern, was that the gases would leak through the fiberglass wire shielding, regardless of the epoxy casting. I was right. I found that I would have to shave away a portion of the shielding, leaving bare wires, in order to provide a “break”, where the epoxy could envelop the wires and effectively seal against refrigerant gases. Further problems were encountered when I rushed the testing of these devices, only allowing the epoxy to cure for approximately one hour. The nitrogen pressure test resulted in device failure, and further restorative castings were of no use without allowing for proper cure time. Finally, after two failures, I was able to produce these embedded thermocouple devices in single castings, by allotting a full 24 hour curing time. I have since produced a number of these, mainly in the 1/4″ flared tee size, but also in a 3/8″ copper brazed tee, and an embedded 1/4″ size, brazed to a 1″ copper separator tank. I feel confident in my production technique. Here, you can see the metallic portion of the assembly, ready for a thermocouple wire. The original purpose of the crimping in the copper stub, was to provide an effective mechanical “grip” for the epoxy, in order to avoid a catastrophic separation of epoxy and copper. I still believe that logic is sound, and continue the practice, but I’ve found there is a second reason, and quite important at that: You must avoid the flow of workable epoxy into the desired path of refrigerant flow. I found this out the hard way, ruining at least two sensors. The crimping helps to avoid this unfortunate end to some delicate work. Other methods may be suitable to prevent this, but I am cautious against introducing other substances into the copper, as they may have deleterious consequences, possibly by being dissolved or reacted with the hydrocarbon refrigerant I work with. 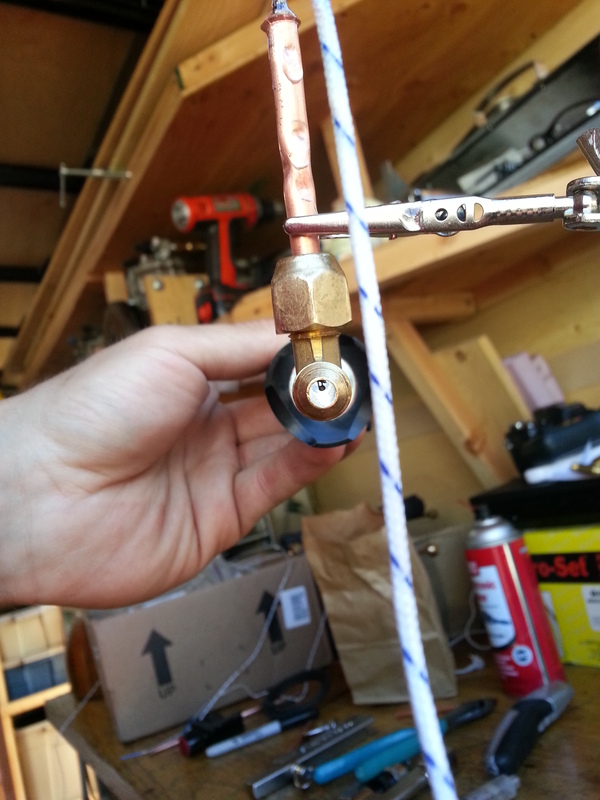 (propane) The many wraps of electrical tape are applied so as to fit the inside diameter of a piece of 1/2″ vinyl tubing, used as a casting form. The green plastic, insulated thermocouple wire, is just another type I use. I was hoping that this insulation would not pass gases through it, but I found, to my chagrin, that propane was escaping through the entire 30 cm length and exiting at the plug on my meter! As you can see, I had to shave approximately one cm of insulation, in order to resolve the issues. The bubbles in the casting do not seem to cause any problems. It is important though, to agitate the epoxy while it is workable to avoid any large voids, especially below the height of the copper. I accomplish this by sliding a used plastic wire tie down between the casting form and the copper. I do this action only a few times, so as to avoid “pumping” it down the copper stub. 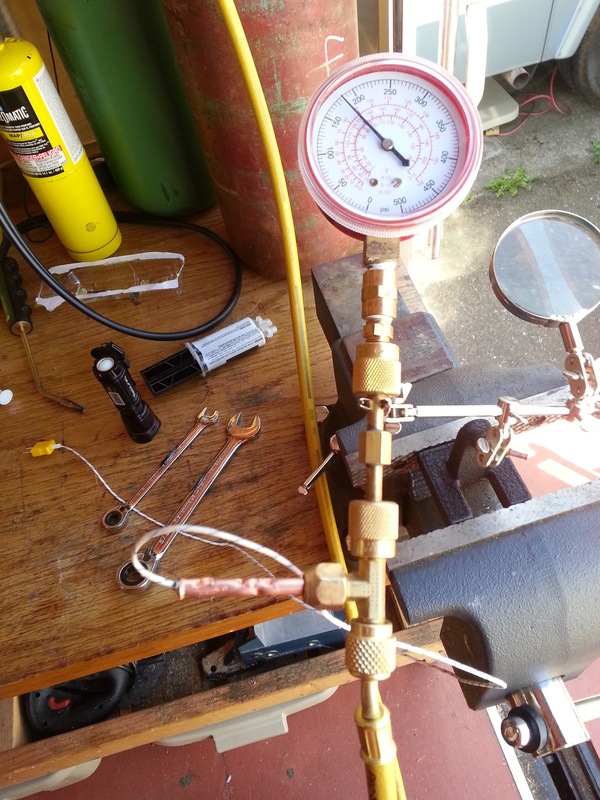 This was the setup for pressure testing. This image appears to be of the very first experiment. Later models have been tested to as high as 450 psi, without leaks. This type of temperature measurement is probably not necessary for most projects, however I felt I desired direct readings for my current research. With some thorough searching, I was unable to find anyone doing something similar for higher pressure applications. I had to figure this out for myself. At this date, I use a cheap two part epoxy purchased at Harbor Freight Tools. It seems to do the trick, and results in a nice clear casting. I hope this article has been of some use to you. You may want to look into EGT probes. 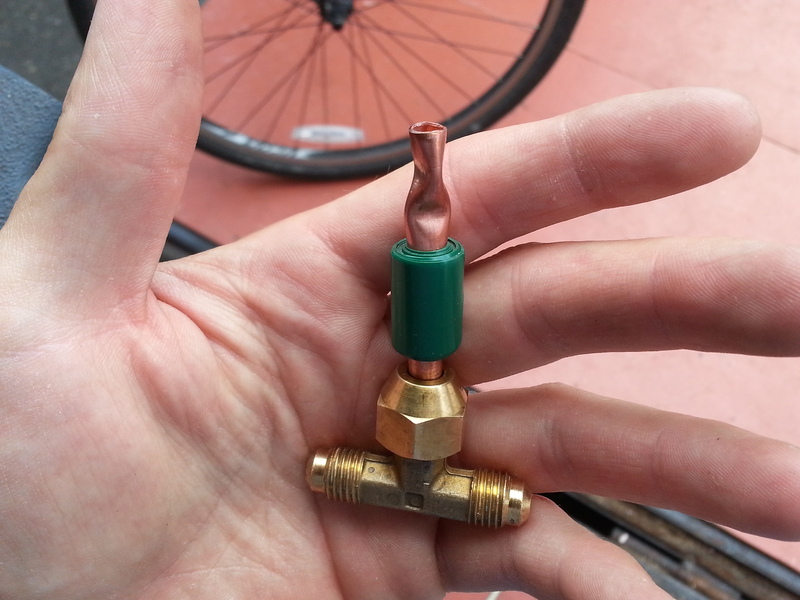 It’s a type K thermocouple that fits into a compression fitting. Thanks K. I figured there would be something out there to suit my purposes. I’ll look into it.